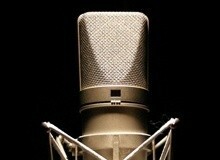 sE Electronics completes its sE X1 studio microphone series with tube and drums models as well as a Vocal pack. Sennheiser unveils today at the NAB Show 2014 in Las Vegas a new condenser, large diaphragm and multi-pattern studio microphone. Lewitt may initiate a new studio revolution with its two new condenser microphones, which are introduced at NAMM 2014 this weekend. M-Audio will introduce in a few hours at NAMM 2014 its new Vocal Studio large diaphragm condenser microphone for direct recording to Mac and PC.